They're finally here and they are delicious! We've been eating raspberries several mornings for breakfast with a some yogurt and topped with chopped pecans. Yum! This weekend I harvested one big batch and made a raspberry buckle (kinda like coffee cake). Looks like there may be just enough left on the bushes for one or two more good breakfasts. The chard seemed to take a long time to come up but now that it has, we can barely keep up with eating it. I harvest about 1 bunch of the largest leaves for dinner one night (shown here). In about two days time the plants grew back so large that it looked like the I hadn't harvest any leaves at all. This is... geez, I'm not sure what this is. Whatever it was, it ain't no more. We must have taken this picture a week or two ago because now there is no part of any bed that has this much empty space. The crowder peas are... well... they're really crowded. :) As of this photo, they had just barely started to flower. Just like last year, once the Spring snow and snap peas were done, the Summer cow peas started filling in. The cabbage is forming heads which is great, but the bugs are certainly getting to them. Looks like we need to sprinkle some BT this weekend. This, again, was taken two weeks ago because these tomatoes are now three times this size. If you look just left of center you can see the long green beans. They can be hard to see at first, but as you move the leaves out of the way, there are tons of them. I made a big batch of beans and potatoes which was enough for dinner and lunch the next day. This past weekend I made green beans and shitake mushrooms which was enough for two dinner side dishes and one left over lunch. Tom is in NYC on a photo shoot right now and he always gets to eat fantastic food. He ate the left over green beans and mushrooms for lunch before his flight and sent me the following text: "WOW, our fresh green beans and your amazing dish are WONDERFUL! I'll be hard pressed to eat something as wonderful in New York." And there were STILL enough beans to blanch and freeze. I'll harvest more today and freeze them as well. Let's talk cucumbers. We all know they're one of my favorites even though they're not super versatile. Similar to the Swiss chard they certainly do keep producing. 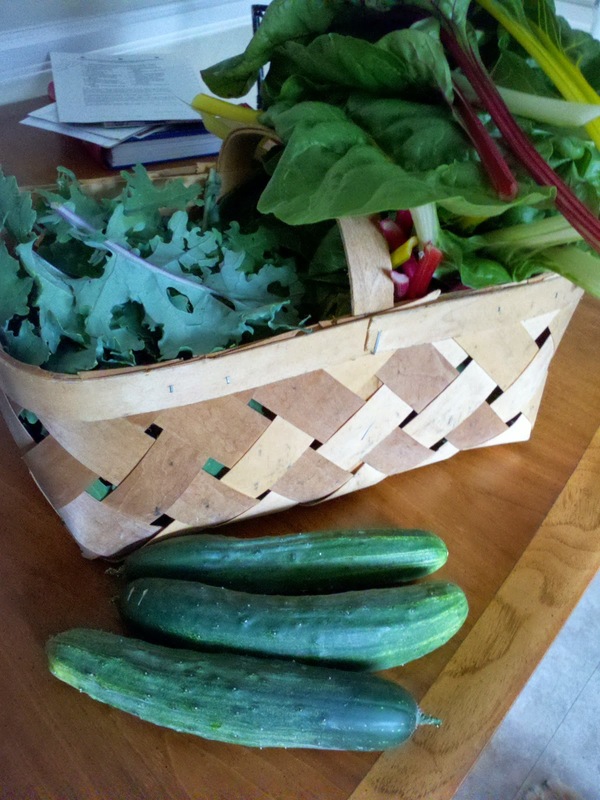 After pulling the first cucumber of the season, two ready to pick the next day. After picking those two, there were four ready the next day... you get the picture. Even after splurging by making cucumber water several days in a row, and coming up with a new cucumber 'appetizer' to enjoy before dinner each night, I've STILL given away a few bags worth of cucs to friends. Cucs aren't Tom's favorite so I tried to think of a way to have them that might spark his interest. 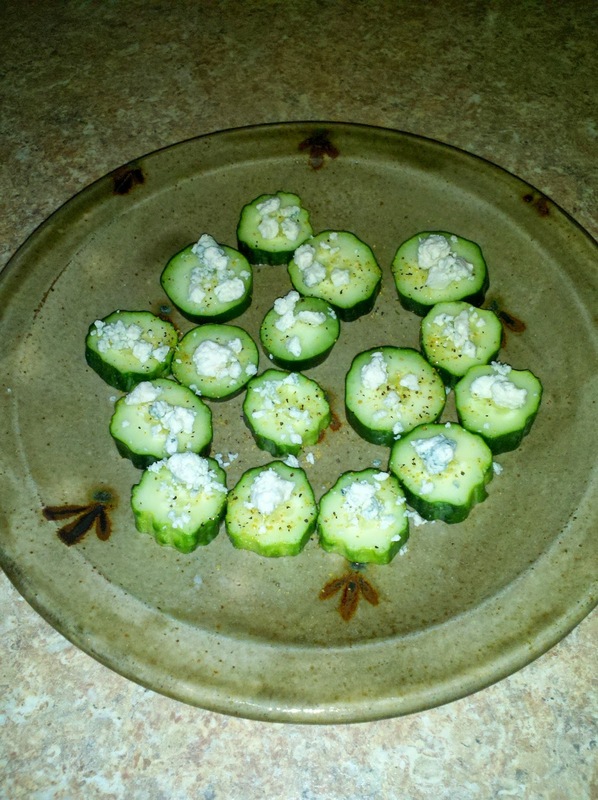 I sliced one up, sprinkled it with lemon pepper, and topped with just a few pieces of crumbled blue cheese. We both LOVE it. So from now until the cucs are done, this will be our before dinner appetizer. Is this what I think it is? No. No way. This can't be broccoli! 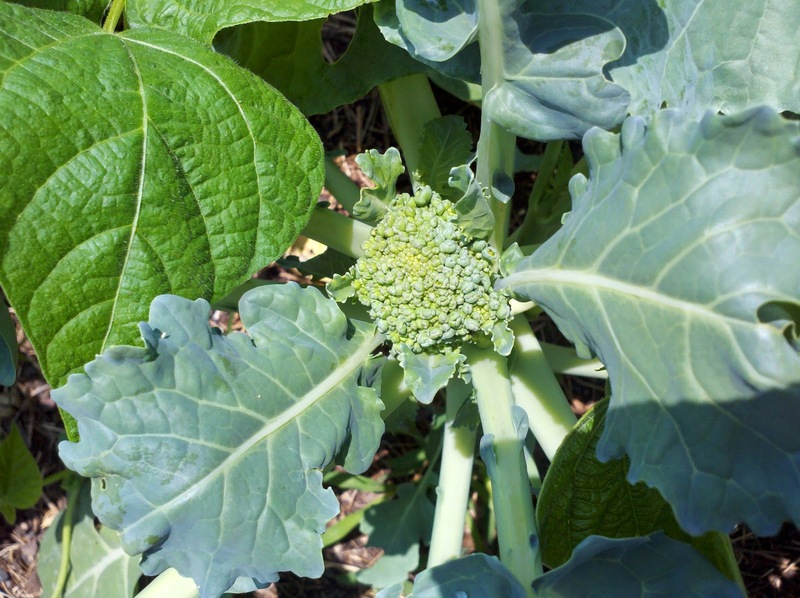 I mean we planted broccoli sure, and the plants came up and all. But as you well know, we are always able to get broccoli plants, they just never produce the part you eat. I mean this is what, our fourth attempt at broccoli? OH MY GOSH, IT IS BROCCOLI!!!!!!!!!! (Sorry about the color on this.) This is a BIG harvest of oregano that has been drying for a few weeks. I think it's safe to say we'll have plenty of dried oregano through the winter. A proud vegetable grower cooking and puttin' up lots of good food. Due to vacations and traveling, the garden has exploded with green-ness. Granted some of that green is weeds but much of it is not. This is a mass of pole and bush beans that are just starting to flower. The broccoli and cabbage started from seed has really taken root. Keep your fingers crossed that THIS will be the year we get broccoli to sprout. Lots of snow and snap peas coming in. SO good in salads. Now THIS is a lettuce bed! The Russian kale is doing well, we just have to eat it up before it gets too hot and bolts. After having made an awesome kale salad, I decided I don't like the Russian kale as well as standard curly kale. I've noted that for future seed purchases. The chard that Tom painstakingly uncovered is just about ready for a first harvest. The cucumber plants are still small but as I looked under the leaves I say blossoms which means cucs aren't too far away! Tom pulled out the Mantis Tiller to weed two small areas in beds 3 and 4. It made quick work of the job. Once the weeds were out, he planted all of the tomato and peppers seedlings which means our summer garden is official planted! THE RASPBERRIES ARE HERE! THE RASPBERRIES ARE HERE! I started a lot of herbs in pots but only the dill and thyme sprouted. So I planted those two (too small to see in this picture) along with basil, cilantro, chive, and parsley seeds. Basil has done well in the past started in pots, but it just didn't sprout this year. Although I like getting a jump on the season, it may be best to stick to planting herbs direct. They don't want to come up until it's super hot outside anyway so it may be just as effective to wait. The large plant you see here is the oregano that came back on its own. And of course the standard dogs-enjoying-the-shade photo.